I'll be the first to admit I have ADD. I'll get obsessed with a particular product or hobby, indulge in it until I get sick of if, and then get seduced by something else. Right now, I'm going through a melamine dinnerware phase. Like a kid in a candy store, I'm drawn by the bright colors and patterns. It's an affordable way to add punch to my sensible but bland all-white dinnerware set. I love the classic patterns offered at LAPlates.com. Each plate can be customized with a monogram or personalized text. The tough part is choosing a pattern. 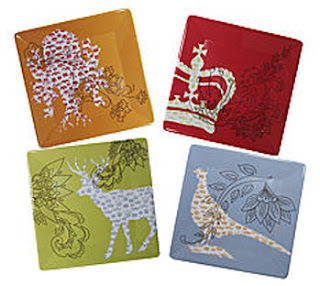 For my next dinner party, I would get the Flora and Fauna plates from Uncommon Goods. I know the woodland creatures trend is so yesterday, but they are the perfect size for appetizers. 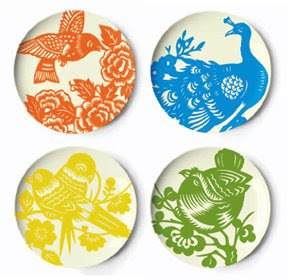 These Aviary plates from Tomas Paul are too pretty to use. I'd hang them in my kitchen as decoration. I just might throw a dinner party as an excuse to buy these plates. Labels: melamine dinnerware, melamine mixing bowls, melamine plates.